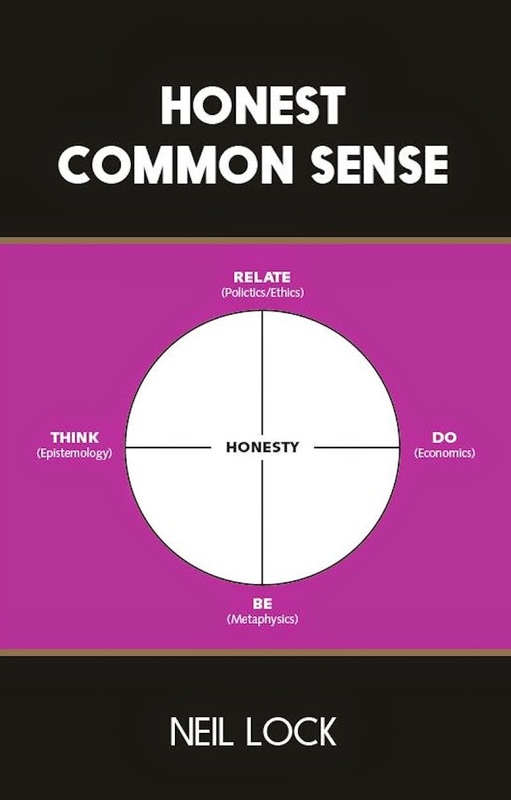 In September, I received Neil Lock’s new book Honest Common Sense. Neil Lock is an English libertarian, whom I have known since my first: Libertarian conference in Leiden in 2004. In the summer of that same year, Neil Lock and I both attended the ISIL conference in New Zealand. After the conference, the two of us spent a few days touring the North Island of New Zealand. In the following years, we have met at almost every libertarian conference: in Gummersbach, Prague, Berlin and other places. Neil Lock told me some while ago that he was busy writing a book; and this year his book has been published. The book begins with an introduction to the philosophy; its main goal is to set out the author’s starting points fully and clearly. The core of the book consists of four anchor points: Think (epistemology), Be (metaphysics), Relate (politics and ethics) and Do (economics). At the heart of his thesis is the idea of Honesty, which he defines as “being true to your nature.” In Holland we would say, Wees wat je bent (be what you are). He brings out the concept of Honesty for each of the four anchor points. Above all, it is the clarity of the author’s style which is refreshing. Neil Lock has the unmistakable advantage of being a native English speaker. The English prose is simple and precise, and always stays close to reality. Wide ranging reflections on “the essence of things,” for which German philosophy is well known, are not part of the English language tradition to which Neil Lock belongs. Perhaps this may be because the English philosophical tradition has always had more in common with Aristotle than with Plato, whose allegory of “the Cave” tends to lead towards speculations not grounded in the real world. The fact that Neil Lock is trained in the exact sciences may also, naturally, play a role. The problem that Neil Lock raises is that nation states, as we know them today, fail to serve either human community or Civilization. The nation state, as it has evolved since Napoleonic times, is a step back towards tribalism. The regression that Neil Lock identifies shows itself in four ways. A gap between what the media tells us and our own experience. A gap between the way in which people behave towards others in daily life, and the behaviour shown in the spotlights of politics and the media. A gap between professed morality, such as the biblical Ten Commandments, and the way in which the political establishment start wars, arbitrarily raise taxes and tell lies when it suits them. And last, a gap between the lifestyles of ordinary, productive people, who look to commerce for the satisfaction of their needs, and the way the political establishment treat those same productive people like cows to be milked. This regression didn’t begin today or yesterday, but has already been happening for more than a century. Since the belief in progress got transmuted into “progressive” politics, the human spirit has been in a recession. Neil Lock wants to revive the human spirit. The same spirit he sees embodied in the work of two people he admires: John Locke, because of his groundbreaking political work Two Treatises of Government, and Richard Feynman because of his scientific integrity. At the end of his book Neil Lock draws, among others, the conclusion that a revolution is not desirable, because of the violence that always goes with revolutions. Nor does he see salvation in acquiring power through the ballot box. He envisages a war between Civilization and state power, and because of this he chooses education as the way towards change. The education phase he calls the “Resurgence.” It isn’t difficult to see here a parallel with the Renaissance. Just as Thomas Aquinas laid the groundwork for the Renaissance, so the groundwork for the Resurgence has already been laid by Ayn Rand with her philosophy of Objectivism and its re-valuation of the work of Aristotle. The education is directed towards making people understand that the pursuit of development and Civilization is more important than loyalty to a political community or to the nation state. Once this is done, it will be time for social transition; the rejection of state power, and the repudiation of its functionaries. In Lock’s view we see a clear parallel with the insights of Canadian conservative writer and pundit Mark Steyn. One of Steyn’s favourite one-liners is: Culture trumps politics. In other words, once you have a grip on the culture, you get the political power for free. Many libertarians would agree with Lock and Steyn on that. Neil Lock’s book is a welcome contribution to the debate about how, going forward, we can best build on the foundation laid down by Ayn Rand and others.